Charles is usually considered the first King of Naples from the Bourbon family. He was the great restorer of the Kingdom, but the first king of that dynasty who reigned over the South of Italy was his father Philip V when he ascended the Throne of Madrid in 1700. During the events of the long War for the Spanish Succession, Philip – although winner of the war and for this reason real king of Spain – lost the viceroyalty of Naples and Sicily in favour of the Austrian Habsburgs, who kept it until 1734, the year when Charles of Bourbon – son of Philip V and his second wife Elisabeth Farnese – conquered the Neapolitan viceroyalty with the diplomatic help of his mother, became its king in every respect and restored the autonomy of the Kingdom of Naples by making it an independent and sovereign state. To this matter, the historian Angelantonio Spagnoletti wrote: «When in 1734 don Charles of Bourbon, son of Philip V king of Spain and Elisabeth Farnese, succeeded in coming to Naples and expelling the Austrians who had ruled it since 1707, everybody immediately understood that his conquest did not forebear a return of the Spanish rule over the South of Italy. In fact, although he maintained strong relations with Madrid especially at the beginning, he affirmed an independent political state, which, as such, was acknowledged by the Vienna Peace Treaty in 1738 (…) After more than two centuries of foreign rule (first Spain and than Austria for about 27 years), a new independent state appeared in the Italian political scenario» [SPAGNOLETTI, Storia del Regno delle Due Sicilie, Il Mulino, Bologna 1997, pp. 17-18.]. Charles was born as the elder son of a second marriage on 20 January 1716. By birth, on his mother side – Elisabeth Farnese’s father was the son of a lady of Medici – he already was a pretender to an Italian principality including the Duchy of Parma and Piacenza and possibly also the Medici dominions in case of dying out of the direct branch (as it started to appear). Only by overcoming a series of obstacles did Elisabeth cleverly succeed in guaranteeing her son the Duchy in 1732, under the tutelage of his grandmother, the widow Duchess of Parma. Meanwhile, the previous year Charles declared himself “great Crown Prince” of the Grand Duchy of Tuscany, since the dying out of the Medici family was then sure and Giangastone, the last Grand Duke still alive, was appointed as his co-tutor. When the War to the Polish Succession began, Charles’s future changed. In fact Elisabeth put him at the head of an army in Italy and sent him to conquer the Kingdom of Naples ruled by the Habsburgs since 1707. On 20 January 1734 Charles declared himself of full age – therefore out of any tutelage – and marched from Florence to Naples. In Monterotondo he addressed the Neapolitans a proclamation of Philip V supporting the enterprise: on 10 May he entered in triumph to Naples. Five days after he received from Madrid a deed of Philip V by which the latter transferred all royal rights of the conquered Kingdom to his son. Charles, availing himself of his rights, defeated the Austrian at Bitonto, conquered Sicily and on 2 January 1735 adopted the title of King with no number: in July he was crowned King of Sicily in Palermo and on 12 July he came back to Naples. However, the young king was in a phase of his life in which he was still influenced by the policy of his powerful parents who in 1737, Franco Valsecchi described the Queen as follows: “The young bride was not just an ordinary woman: when she arrived in Naples, her youth won also the most prejudiced; She had an amiable disposition and sense of humour, she was good-natured and a cultured person – she spoke French (her mother tongue), but also Italian and Latin. She immediately got a great ascendancy over her husband, but did not use it, at least in the first years, to exert a political influence…”. Only in the last period of her life, when she was Queen of Spain, did she assist her husband also politically. See F. VALSECCHI, Il riformismo borbonico in Italia, Bonacci, Roma 1990, p. 81. chose the daughter of the King of Poland, Maria Amalia, as his wife. The end of the War for the Polish Succession in 1738 involved as consequence the Habsburg conquest of the Farnese’s Duchy of Tuscany (the Grand Duchy was definitively taken by the Habsburg-Lorraine), whereas, by the Peace of Aachen, the Duchy of Parma and Piacenza was given to Charles’s younger brother, Philip, who started the Bourbon-Parma family. In Naples, Charles ruled with the help of a State Council formed by ministers chosen by his parents and therefore influenced from Madrid (among them we mention the Earl of Santostefano, the Marquis of Montealegre, Tanucci, Brancaccio). in 1742, during the War of Austrian Succession, Charles sent an army corp to Lombardy to help the French-Spanish army (all lineages of the Bourbon family were allied); however, it happened that a British fleet appeared in the Gulf of Naples and threatened Naples with shelling the city; Charles decided to withdraw his army corp, which made Paris and Madrid angry. He was able to redeem himself in 1744, when he completely defeated an Austrian army at Velletri, put a final end to the Habsburg claims over Naples, and succeeded in setting himself free from the tutelage of Madrid. With this victory, Charles began to act as the real king of Naples. The Kingdom became independent in all respects. This became even clearer in 1746, when Philip V of Spain died and Elisabeth was set to one side: in fact Charles dismissed Montealegre and replaced him with Fogliani. Valsecchi wrote: «Until then, Charles’s reign had been a Spanish-Italian monarchy: from that moment on, it became an Italian monarchy» [Ibidem, p. 88.]. From that moment on Charles became the real “King of Naples” in full agreement with his people and their needs. As years went by, he rose above the influence of his ministers and became a great sovereign and the real author of his policy by centralizing power in his hands: «Squillace and Tanucci, who occupied the most important positions, were his creatures; and although they enjoyed his confidence, were limited in their powers and subject to his direct surveillance» [Ibidem, p. 91.]. After five daughters, Maria Amalia gave Charles his first son, but unfortunately the baby was mentally disabled; after him, other four sons were born (Charles Antonio, Ferdinand, Gabriel and Francis Xavier), thus assuring the succession. However, “dynastic” threats hung over the kingdom. In fact Charles was destined to succeed his step-brother Ferdinand VI on the Throne of Spain, since the latter had no male heirs and the great powers with the League of Aranjuez and the Treaty of Vienna had established that his kingdom would go to the Duke of Parma and Piacenza, Philip of Bourbon, and that the two Duchies would go to Austria and Savoy respectively. In reality, to ascend to the Throne of Madrid, Charles risked to loose the kingdom he had conquered for himself. When in 1759 Ferdinand VI died, he succeeded him on the Throne of Madrid with the name of Charles III, and renounced the crowns of Naples and Sicily (as foreseen by the Bourbon hereditary regulations; Charles strengthened this decision by issuing a Proclamation on 6 October 1759 by which he, once King of Spain, finally ratified the irreversible process of separation of the two Royal Families), and gave them to his third son Ferdinand, who at that time was only eight (his second son Charles Antonio followed him to Spain as heir to the Throne). The regency was given to eight ministers, among which Tanucci, Prime Minister and Minister of Foreign Affairs, but always under the supervision of Charles from Spain. «Naples owed him the greatest benefit: independence and all its good consequences, after 230 years of foreign rule», as Michelangelo Schipa wrote in “Enciclopedia Italiana” (sub voce). The last years of his life would be embittered by his disagreement with his son in Naples and in particular with his wife, Maria Carolina, Empress Maria Teresa’s daughter, resolved to break the Spanish influence at the Court. His work, however, would remain unforgettable in the history of Naples. He died in 1788. In fact, Charles’s main merit is that of restoring the “Neapolitan State”, making the Kingdom independent and sovereign, as Spagnoletti also wrote. Although the most important and recent studies are now re-evaluating the Habsburg policy of the previous centuries (see Elìas de Tejada’s works), it is of no doubt that only after the crowning of Charles that the Neapolitan government, its sovereigns and ministers began to think and act in the exclusive interest of the Kingdom of Naples and its inhabitants. Weighing the achievements of Charles’s rule in Naples, the historian Giuseppe Coniglio wrote: «Charles, at the eve of his departure for Spain (…) had settled whatever he could foresee and had obtained the approval of the great powers (…) Charles’s sons and brother would reign without problems and hand down the Throne to their heirs; the diplomatic construction turned out to be efficient, overcoming hard times both in Spain and Italy» [G. CONIGLIO, I Borboni di Napoli, Corbaccio, Milano 1999, p. 159.]. The famous historian Franco Valsecchi wrote VALSECCHI, op. cit., pp. 75-79.: «To the Neapolitans, Charles’s crowning was more than a simple change of dynasty. It was the restoring of the ancient kingdom, after centuries of foreign rule (…) The governments that followed each other in the first thirty years of that century were foreign governments, distracted from far and alien worries. Also the new king was a foreigner; but he did not come as a foreign ruler. The hopes of the Neapolitans were lighted up: “thanks God we are no longer provincials”. It was up to the new national dynasty to interpret the new reality and its needs». And the Neapolitans felt involved and in agreement with the new dynasty, as they would show from 1799 on by their uprisings and Sanfedismo, their armed resistance against the Napoleonic invaders. Schipa described Charles’s qualities in the page he dedicated to him in the “Enciclopedia Italiana”: «frugality, religiousness, good disposition, precision, purity of habits, love for artistic works (…) Irreproachable in his personal qualities. As king, he loved his people and tried to do the good of the country….» Very religious, he did not submit to the Pope’s directives although he never forgot «to pay his respects to the Church as its devout son. He did not like things that were not part of traditional faith» [Ibidem, p. 90.] : hence his strong condemnation and persecution of Freemasonry according to Benedict XIV requests. However, he was equally harsh against the excessive luxury in which the clergy lived and especially against the Jesuits, in particular in Spain, where he implemented the sensational expulsion of their Order from the Reign and used their assets to build up seminaries and cultural institutes. He had a flawless behaviour, and was a faithful husband: hunting was his only real hobby. 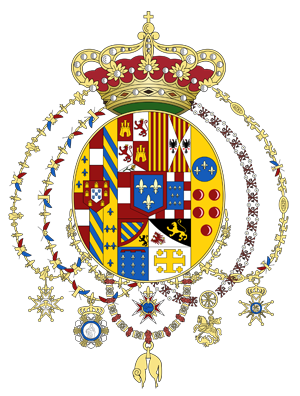 He always had in mind the good of his people (he did his best to assuage the needs of the poorest) and this pushed him to start – especially in the Kingdom of Naples – a policy of administrative, social and also religious reforms that made the Family of the Bourbon Two Sicilies famous. Michelangelo Schipa and other historians support that he did not accomplish the reforms he had started, which were implemented completely by his successors; however, we must credit him the merit of starting them and leaving this way of thinking to his successors too. Moreover, he had to leave Naples for Spain. In fact Schipa said that, thanks to his government, Spain underwent a renewal after decades of decline. Here are the main activities he implemented or began: to better see the wide range of initiatives and interests he implemented for the sake of his subjects, we list them as construction works. Starting from civil building – to which the Sovereign paid a great attention to stress by the luxury and beauty of royal buildings the splendour of his dynasty – we must first of all mention the restoration of the Royal Palace of Naples and the construction of the splendid Royal Palace of Caserta (as real grandchild of Louis XIV), second royal palace in the world as for beauty and size; and then the Royal Palace of Portici, the magnificent obelisk of St. Domenico in Naples, the St. Charles Theatre, realized in 270 days, the Casina of Persano, the Royal Palace and the woods of Capodimonte, the Marinella and Chiatamone roads, the pier and harbour, Mercatello Square, Pizzofalcone district, the obelisk of Conception at Gesù Nuovo, the “Cavalleria della Maddalena” district, the restoration of the harbours of Salerno, Taranto and Molfetta, the construction of Girgenti harbour, several roads, etc. Concerning military buildings, we mention the Granatello Fort, the military barracks of Aversa, Nola and Nocera, the restoration of many strongholds and the construction of many others, the creation of a national army and a fleet, the most important fleet in Italy and the first at European level, the construction of military factories that emancipated the kingdom from foreign monopoly. Concerning religious and charity buildings, the King had always in mind the needs of the poor. The Immacolata Concezione Shelter for Poor Girls, the Association “Vestire gli ignudi”, the Association “Collegio delle Scuole Pie” in Palermo, the “Immacolatella”, the great Shelter for the Poor in Palermo, the Monastery of St. Therese at Chiaia and Pontecorvo, the two huge shelters for the poor of the kingdom in Porto Nolano and S. Antonio Abate, S. Maria Maddalena Retreat for repentant women, the Monastery of Carmelite Nuns in Capua, the restoration of the Church of Our Lady of the Annunciation in Naples, etc. Concerning cultural buildings, the new magnificent seat of the University, the excavations at Pompeii and Herculaneum, the Herculaneum Academy, the Mosaic Factory, the establishment of new academies and chairs all over the Kingdom, the Royal Library that became the great National Library, and the National Museum. The King called G.B. Vico to the Palace as royal historiographer. Among the commercial initiatives, to save the very difficult economic condition of the kingdom, Charles established a Trade Council, opened negotiations with Turks, Swedish, French and Dutch, established an insurance company and adopted measures to protect forests, tried to exploit mining sources although he had to stop this latter initiative due to a lack of funds; however all these initiatives did not give the expected results, at least not immediately. The most famous artistic and commercial initiative was that of Capodimonte porcelains. Apart from the very high costs, Valsecchi described this initiative as follows: «it was a magnificent creation, able to portray an image of popular and aristocratic life in Naples with an exquisite artistic taste and talent». He also established consular offices and wheat shops, passed laws to enhance agriculture and stock rearing. In 1741 he signed an agreement with Rome and started to impose taxation on some properties of the Church, then he updated the tax system; he improved the then chaotic legislative situation by passing a new code in 1752, although this code was not blindly applied, and took care of the legal system, but without upsetting the centuries-old social order of the State. In 1759 Charles went to Madrid to ascend to the Spanish Throne. But he left a real Kingdom to his son, a new kingdom, a kingdom directed on the road to reforms and social and cultural progress, a kingdom loved by its subjects. This is the most important richness that his descent will inherit from him.